*Please note that you can upload images to a text page, as shown on the Home Page or on this page below, plus you can make any image you upload link to a page on your website or link to an external website. Please refer to the Frequently Asked Questions page for details of how to do so. You can also easily swap the order of the pages created at the click of a button. Primarily your chosen design/layout already has the headers, text, font, etc. formatted for that particular design, but you may wish to make certain text bold, italics or underlined, for example, which is done at the click of a button in your admin control panel. Please note that it is usual for hyperlinks to be underlined, so underlining text that is not a link can become confusing. You can also easily put a box around selected text, such as the box around this section on this web page, by selecting the relevant text (by clicking and dragging your mouse over it) and pressing the Box button which is situated immediately to the left of the "Colour" drop down box in your page editor of the admin control panel. 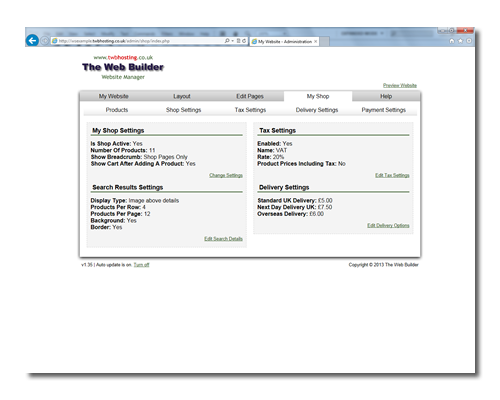 The twbhosting Website Manager has a user-friendly admin control panel which is really easy to use. The screen shot below, for example, shows the Premium version's shop settings with links to easily edit these details and preview the website once you've made the changes, which take place instantaneously. There's also a comprehensive help section for reference. For information about changing the layout of the website, see Layout.